Hello, Summer Splash II attendee! 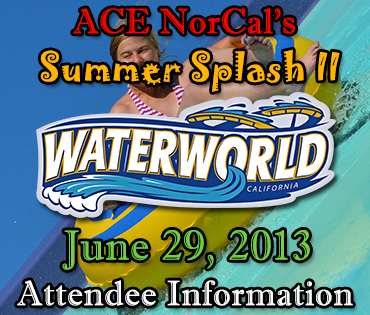 Below you will find all of the event information for Waterworld California, including the tentative schedule, up-to-the-minute updates (if needed) and other news regarding the event. Check back to this page often to see if anything has or will change. Remember to flash the event flier for free parking in the parking lot! Event check-in will begin at the park entrance at 10:00am. If you will not make it by 10:30am, your tickets will be held at Will Call, located on the right side of the entrance plaza.The above schedule is tentative and subject to change at anytime without notice.